청자 투각고리문 의자(靑磁 透刻連環文 墩)는 경기도 개성에서 출토된 고려시대 만든 청자로 된 유물로 모두 4점이다. 높이와 몸통의 지름은 각각 ① 49.5㎝, 38㎝ ② 48㎝, 38㎝ ③ 50㎝, 35㎝ ④ 48.5㎝, 34㎝이다. 13세기 작품으로 장식기법상 2가지로 분류할 수 있다. ①·②형은 맨 윗면인 천부에 연꽃무늬를 각각 음각하였다. 몸통에는 활모양을 세로로 어긋나게 엮어 놓은 모습으로, 뚫어서 조각하는 투각문을 사용하였다. 이 뚫을무늬대 상단에는 덩굴무늬를 음각하여 돌리고, 하단에는 국화무늬를 뚫어서 장식하고 있다. 굽다리에는 거칠고 간단한 2겹의 연꽃무늬를 음각하였다. ③·④형은 몸통에 큰 타원형의 고리 모양을 세로로 어긋나게 엮어 놓은 모습을 음각하였다. 상단에는 덩굴무늬를 음각하고, 하단에는 4면에 안상을 하나씩 뚫어서 조각해 놓았다. 굽다리와 맨 윗면의 장식은 ①·②형과 동일하다. 유약은 회청색이며 전면에 고르게 녹지 않아서 색깔이 짙고, 엷은 부분이 눈에 띈다. 굽 가장자리 부분의 유약이 벗겨진 곳은 철색을 드러내고 있다. 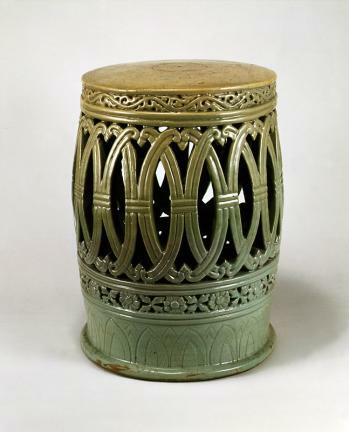 These four celadon stools with an openwork ring design were made in the 13th century during the Goryeo Dynasty. They were excavated in Gaeseong, Gyeonggi-do shortly after Korea gained its independence. The height and diameter of the four items are as follows: ① 49.5 x 38 cm; ② 48 x 38 cm; ③ 50 x 35 cm; ④ 48.5 x 34cm. Their ornamentation can be classified into two types of technique. and ②: The uppermost part is engraved with a lotus flower design. The body is carved with a crossed and tied two bows’ patterns using openwork. The upper part of the bow patterns is engraved with vine patterns; the lower part, with openwork chrysanthemum patterns. The base is engraved with rough and hard double-lotus flower patterns. and ④: The body is engraved with large vertically-crossed oval type rings. The upper part is engraved with vine patterns while the four surfaces of the lower part are carved with openwork panel decoration patterns. The decorations of the base and uppermost part are the same as ① and ②. 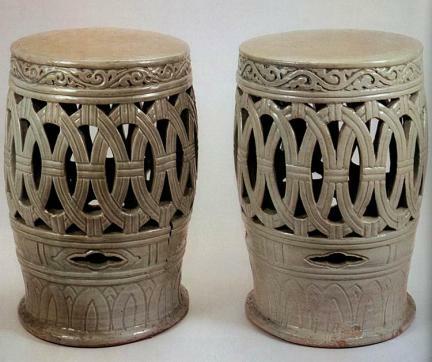 The stools have a gray-blue glaze with deep and light parts as it didn’t melt evenly over the entire surface. The edge of the base where the glaze has come away is exposed in iron blue.